TC loves our couches. For being in a college apartment, they are pretty dang comfortable...but he LOVES them. He claims that's why he comes over, but we know that he loves us second best. He is always stealing the (extremely hideous) pillows, too. Somehow, no matter what, he ends up with four and the rest of us have none. Someone explain that to me. Every time I complain he declares, "But I love pillows!" 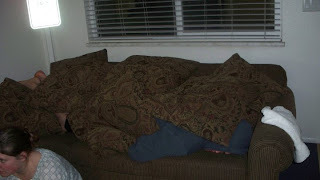 As if that makes it OK.
One day Mr. Clark decided to take a nap on our couch. This isn't all that unusual, but I found it particularly hilarious this time. He already had half the pillows in his possession, so I just made him a little more comfortable.